Foxtrap Automotive is just one of the many garages in Conception Bay South. In the last few years many new residents have moved to our town and are looking for an auto repair shop. We extend a warm welcome. We have been repairing and maintaining vehicles at our location at 170 Foxtrap Access Rd for close to 50 years. We will soon be celebrating this momentous anniversary. It’s now time to look at preparing your vehicle/vehicles for the winter ahead. Drop by 170 Foxtrap Access Rd. or call 834-2022/23 to make an appointment. 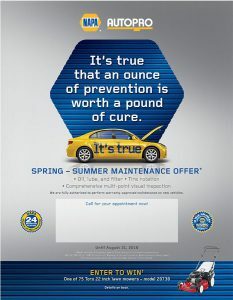 We are an authorized NAPA AUTOPRO Service Centre. Thank you for considering using our services. It is appreciated.